Julia and I had some fun last weekend having a little “switch-off” dinner. Basically, I go in the kitchen and make a little, creative plate that we share together, and then she goes and does the same. The dishes were small and tasty so we were able to have a few rounds of it. We had a lot of fun eating, relaxing and laughing about our cooking and just stuff in general. You need a bit of time on your hands to play this dinner game, but it is a worthwhile couples activity. With my first dish, I decided to utilize some of our best ingredients in a simple way with a play on a bruschetta. I took four long, thin slices of beer bread and spread some nice horseradishy mustard on each side. I heated a little Smart Balance in a pan and then put the slices in to absorb a little bit of the flavor and crisp up a bit. I had shredded some amazing sharp, Irish white cheddar and put a nice heavy pinch of it all over the top of each piece of bread before carefully flipping each one, so the cheese ended up on the bottom. I then sprinkled a little more cheese on top of the “bottoms” and let them crisp a little more. Once the cheese on bottom was crisped enough that it was not sticking to the bottom, I flipped the breads again for just another minute. The breads were golden, orange and crispy on both sides and smelling great. I put two of the thin slices on each plate and then topped each plate with some salad of arugula, diced Roma tomatoes, extra virgin olive oil, balsamic vinegar, sea salt and cracked black pepper, which I had dressed up in a separate bowl on the side. I then shaved off a few more bits of cheddar onto each plate for garnish. 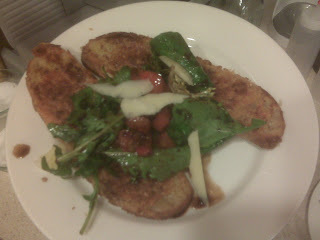 All done was my fresh take on bruschetta – less garlic and oil and more greens and mustard flavor. Julia very much approved of my dish, loving the subtle decadence of the plate without losing its freshness and crispness. I might have said it was the best appetizer served that night if not for the beautiful overeasy egg, kalamata olives and lime yogurt sauce over a toast round that Julia served to me some 20 minutes later. She must have read my 101 favorite foods and known that while balsamic vinegar (#39), extra virgin olive oil (#28), sharp cheddar cheese (#23), arugula (#25) and Roma tomatoes (#51) all appear high on my list – that she could even win me over ME with a perfect egg (#2) and kalamata olives (#11). Although I'm guessing she would have gotten that one right, list or no list.